This is the first room you walk into when you enter the store. 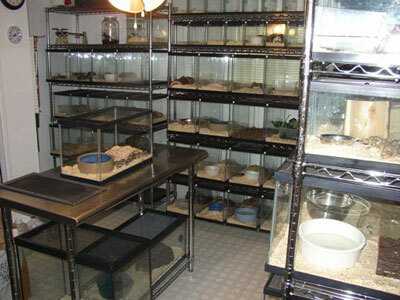 It primarily houses our selection of lizards. Maniac is a 3' Argentine Black and White Tegu. 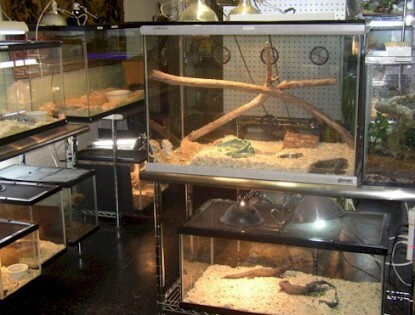 We also keep on display our tank of breeding Bearded Dragons and Mali Uromastyxs. Several species of Chameleons are always in stock. These are Sandra's babies. This is our snake room. 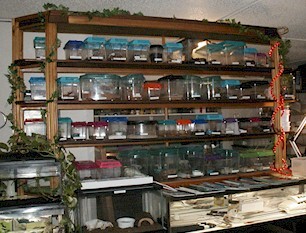 We have a large variety of snakes, well over 50 species always in stock. I have a 12' Burmese Python. Stop in and feed him a rabbit for $10.00. I keep most Burmese Morphs- Green, Albino, Albino Green. I keep many unusual species of snakes from Tiger Rat snakes, Asian Vine snakes to Green Tree Pythons and many more. I carry Midwest's full product line of professional snake handling tools, very dependable. This is our Hot Room kept in another location for safety and city ordinance reasons. 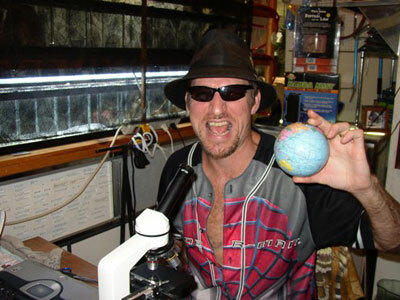 This is where all the venomous snakes and baby dwarf caiman crocodiles are housed. It also serves as a quarantine and hospital area. This is our Spider Room / Book Room. We carry books and magazines on hundreds of creatures. This is our office. This is like the brain of the operation. In here there is no guarantee what you will see or hear. I could be playing Eminem on the radio or show you my monkey head in a jar. I've got Saddam money, gas masks, and skulls.